Last week I started a series about springing cleaning for your writing life. Spring cleaning brings both physical and psychological benefits including increased energy, clarity and an uncluttered space. I focused on reassessing clutter in one’s physical writing space. 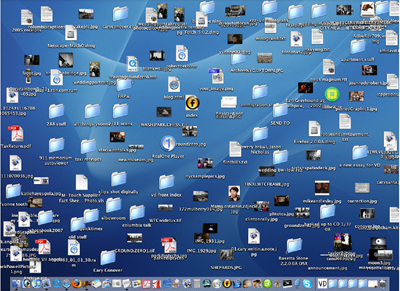 In doing my own bout of spring cleaning, I couldn’t help notice how cluttered my desktop looked, how I was a bookmark acquirer and how all three of my email accounts haven’t been purged or organized in quite some time. After I posted, I realized that e-clutter deserved some time of its own. Managing the digital world too often fails to get (or sustain) our attention. E-clutter is easy to ignore, unlike physical clutter, most of the time as it fades into the larger digital background noise of our lives. While I’ve trained myself that if I bring five books home it means that I have to give away five, I’m less diligent when I subscribe to blogs, accept a specialty coupon by email, or bookmark every passing fancy to ask: What’s my capacity here? Do I really need this bit of information? How often will I use it? Where will I store it over time? These are the kinds of questions that are useful to ask as we go about our day navigating the digital landscape. I’d love to know: What’s your story with e-clutter? How are you managing it? Is it on your spring cleaning list? Any worthwhile tips you can share?